As predicted, the wind ramped up to nuclear levels after last weekend's lucky window. But somehow we still managed to score a couple of spicy and delicious cross country days from Kahana this week, for separate flights in both directions and back. Apparently when the wind is that strong we can't do the whole double out and back loop in one day! We have been hungering for cross country action lately and we'll have to settle for snacks like these until we get some proper feasting weather! On Tuesday, the wind started out howling maniacally all morning, and I wrote off our chances. But by late afternoon there was a strange silence at the house when Thom was visiting. We realized the wind had backed off a lot. Just then Kaaawa Larry called to say he was at the beach and it was looking good. Great minds think alike! Wish I'd realized we'd be flying before I enjoyed a two hour super indulgent feast with Thom at the Thai Truck. I was feeling more like napping than flying. Oh well, nothing like a frenzied rush to hike up and launch to enervate the system. We got up and got nice and high, trying multiple times to cross the bay, but it was too strong and east. But we consoled ourselves with a trip the other way, taking Larry up over Sacred Falls for his first time there. We got up over three grand in the strong flow, dodging clouds as the sun sank behind the ridges. From that height we blazed our way through the strong headwind for the return leg, and two us of made it back, while Larry was forced to ditch at Punaluu Beach Park. On Thurday, the wind was predicted to be slightly mellower than the week's nuclear overall range, and sure enough, it seemed quite promising when I arrived out there to meet visitor Kevin from Vancouver Island. Lots of other folks came out: Gaza, Thom, VI John, Miami Eddie, J-Hole Flynn, and finally ... Duck! For his first flight with us since his MTB accident. We were fairly parked around the ridge in strong northeasterly flow, but Eddie and I took advantage of a slight lull at one point to sneak across the bay into the super strong flow at the Kaaawa ridge, and then over to Kualoa where we could see Mad Dog kitesurfing across Kaneohe Bay. Eddie took a huge whack in his new EN-D Poison as he got low behind the Kualoa side ridges. But fortunately the venom wasn't fatal, and after three turns he pumped it out and got the heck out of there. 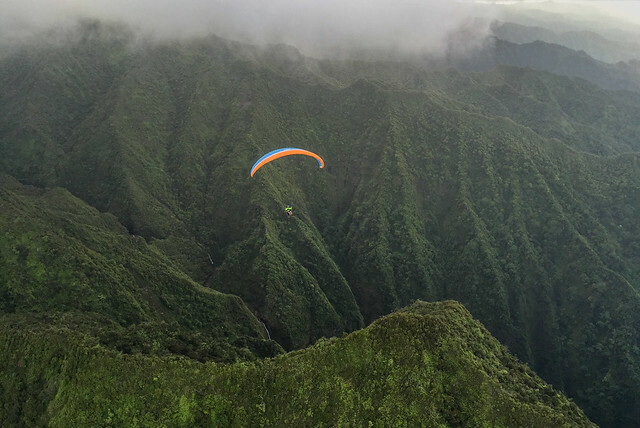 We returned to Kahana just in time to land and hang out for a while to see Thom hike up and fly his Zero. Nine pilots and some cross country action! Who would have thought it.